Once upon a time, a very long time ago, there were two cave-men: Og and Gog. For millions of years, their ancestors had dwelt in the jungle canopy, high above the ground. Now, Og and Gog had come down out of the trees, and had begun to explore the novelty walking erect. One day they came to the edge of the forest. Beyond them lay the vast African savannah: an open plain, stretching away to the distant horizon. They had never seen such a thing before, and it took their breath away. After the initial shock had passed, their curiosity (for they were eternally curious) got the better of them, and they ventured forth into the bright sunlight, leaving the dense shade and protection of the jungle behind. After they had advanced a short distance, their eyes alighted on a gently waving stand of tall grass, about 100 yards ahead. “Uh-Oh!,” exclaimed Og fearfully. 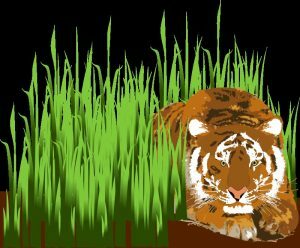 “There might be a tiger hiding in there, just waiting to pounce on us. Let’s run back to the trees!” Gog was unimpressed. “Nah. Don’t worry!,” he replied, attempting to calm his worried companion. “It’s just the breeze causing the grass to move. We’ll be fine!” But Og was having none of it. Making a hasty about-face, he ran as fast as his legs would carry him, back to the safety of the jungle, where he promptly hauled himself up into the nearest tree, heart pounding in terror. Gog watched him disappear with mild amusement, then continued his exploratory walk, alone. Now let’s multiply this episode hundreds of thousands of times, over millions of years. Og – even though he’s usually wrong – reaps a huge genetic advantage: Og and others like him live to a ripe old age and sire many progeny, while Gog leaves fewer offspring – or none at all, depending on when he meets his untimely end. (With apologies to Demosthenes, “He who fears and runs away / Lives to breed another day.”) Thus, over millennia, Og’s genes for vigilance slowly but inexorably spread through the gene pool. Over generations, vigilance morphs into hypervigilance: Always being on the lookout for danger; and (often) seeing danger where there is none. These “vigilance genes” also predispose to hypertension, heart disease, stroke, and maybe even cancer, but all of those disorders strike after the childbearing years have passed (or, peaked). Of course, there’s more to ASD than hypervigilance, and not everyone who is hypervigilant is on the autism spectrum. But hypervigilance and ASD are closely related, genetically and neurologically speaking. If you are the parent of a child on the autism spectrum, the odds are increased that you or your child’s other parent also lie on the spectrum of Og’s descendants, with a bit more vigilance than necessary or helpful. That’s a story for another day. Hello. I am a mother of a 5 year old son (soon to turn 6) who was diagnosed on the ASD spectrum at 34 months. I have read all your research and watched all of your videos that I can get my hands on. I have wanted to tell you that I am deeply saddened that you are no longer seeing patients. I have searched high and low in the Pittsburgh area trying to find a clinician who measures up to you. Who is as committed, educated and sincere as yourself when it comes to the ASD community. I also feel alone because I know that, I am more educated about Autism than the help. It’s a horrible feeling when I have to keep searching for someone who is more knowledgeable than myself. I want to give my son everything but often times I feel my hands are tied. I have so many unanswered questions that I can’t sleep at night. Whoa Dr Coplan, another unexpected way to understand my 3 year old ASD. Who could have thought that two young adults, highly functional, educated and without any family history of mental disorders, could reproduce a child with Asd. Yet, parent 1 is always trying to prevent an upcoming disaster and every mole is “probably” cancer. Parent 2 thinks in pictures, steals other people scripts to produce small talk, and is cognitively rigid. I guess these genes get compounded in the next generation. So here we are…our sweet boy is very smart, very attached and interactive, can make jokes, and is socially aware…but he is also scripting a book at the moment as a reminder that something is “different” and it came from us. Thank you for giving me opportunity to understand something that initially made no sense. First, thanks for writing in. And second, thanks for your kind words. I still miss clinical practice, but I think I made the right decision. The time to step down is when one is at the peak of one’s skills, not wait until one has started to slip. Of course, that’s also the hardest time to step down. I’m still doing some consulting and public speaking, but no longer the day-to-day responsibility of patient care, and no longer the administrative burden of all the paperwork. To extend my understanding of Broad Autistic Phenotype, do these adults have any recognizable autistic traits as 3-4-5 year olds at all? Do they acquire language and learning in “gestalts” or the issues become more recognizable in very complex social situations later in life? Also can a person have relatively intact reading comprehension skills and lets say clear ability to lie, joke and use sarcasm…but just being more egocentric (reduced empathy skills) and less able for social chat make you on BAP? I am trying hard to compare the development profile of my husband engineer to the profile of my very smart 3 year old with mild social/language atypicalities but it seems like husband did not present with recognizable social or communication delays at 3. It just feels that husband has some BAP traits, but his learning profile was neurotypical.